Sales at Yum Brands restaurants in China fell by about 20% in the first two months of 2013 as a food scare drove customers away, but the slump was less than the company had feared. Shares in the fast-food restaurateur jumped by about 6% in after-hours U.S. trading Monday after the company said same-store sales dropped by 24% at its KFC outlets, and by 2% at Pizza Hut restaurants. The stock fell for three months running through January, but began to recover last month. The Chinese New Year had a neutral impact overall on Yum Brands (YUM) sales in the first two months, depressing business in January but giving a boost in February, notably at Pizza Hut. 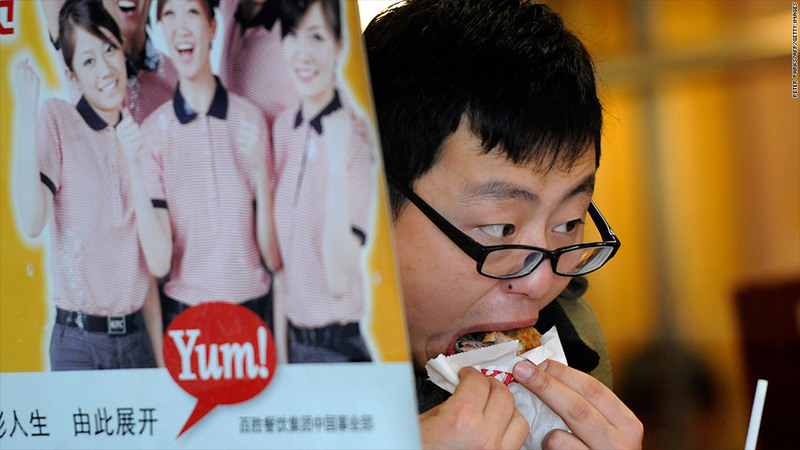 The U.S. company operates more than 4,200 KFC restaurants in China and about 800 Pizza Huts. Customers began deserting the restaurants in droves late last year after an investigation by Chinese food regulators found excess levels of antibiotics and hormones in some chicken products sold at KFC locations. The contaminated chicken was traced to two suppliers of poultry to KFC, sparking calls for a boycott among Chinese consumers. Sales turned "sharply negative" in the final two weeks of 2012, prompting Yum to warn last month that sales would fall by about 25% in the first two months of this year. The company also warned last month that the slump in China would cause 2013 earnings per share to decline. Nonetheless, it remains committed to growing its business in the world's second-largest economy and plans to open 700 new restaurants this year alone. Prior to the tainted chicken investigation, western fast food companies had enjoyed a reputation for safety in China, where consumers have been subjected to a series of scares about contaminated food and drink. Thousands of dead pigs have been pulled out of a river in Shanghai in recent days, raising fears about the safety of drinking water supplies in the city.